The top illustration demonstrates the slip of the lumbar vertebrae. 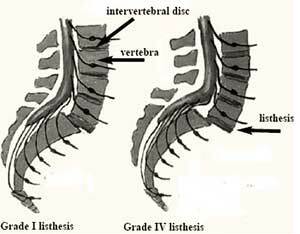 The picture on the left depicts a Grade 1 listhesis; the picture on the right depicts a Grade IV listhesis. Treatment consists of decompression of the nerves and fixation of the spine by pedicle screws, as demonstrated in the bottom picture. In spondylolisthesis one of the vertebrae slips forward on the vertebra directly below it. This can lead to the compression of the nerves that exit through the foramina. The disc is also damaged by the forward movement of the vertebra. The term spondylolisthesis is a Greek term and is derived from the word "spondylos", which means vertebra, and "listhesis", meaning to slip or to slide. Inborn (congenital) – In this case the slippage is caused by abnormal bone that does not develop normally at birth and predisposes the vertebrae to slip. Isthmic – In this case there is breakage of the bony elements that support the joints, which in turn are responsible for keeping the vertebrae in place. This breakage is called spondylolysis. Degenerative – In this case degeneration of the discs and facet joints leads to slippage of the vertebrae. Traumatic – Trauma can lead to a fracture of the stabilising complex that houses the intervertebral joint and this in turn leads to the slippage. Post-surgical – Overzealous decompressions of the lumbar spine during surgery can lead to instability and the inability of the intervertebral joints to stop slippage from occurring. Pathologic – This is when the bone is weakened by a pathological process such as a tumour, infection, bone disease or osteoporosis. Back pain is the most common symptom. Many people are, however, unaware that they have this condition and it can be completely asymptomatic. Spondylolisthesis may lead to mechanical back pain and referred pain. When the slippage is so severe that a nerve root is compressed, it can lead to radicular pain (see the section Back Pain). It can be diagnosed on X-ray, CT scan and MRI scanning. There are different grades of spondylolisthesis and the grading is based on the degree of slippage that has taken place of the one vertebra in relation to the other. MRI scanning is used to evaluate not only the degree of slippage, but also whether there is compression of any of the nerves. As a general rule, Grade I and Grade II slips can be treated conservatively. The symptoms are generally limited to mechanical back pain and referred pain. These are treated with the usual conservative therapies of analgesic medication, anti-inflammatory medication, physiotherapy and chiropractic treatment. The back can be supported by following an exercise programme overseen by a biokinetician. A brace can be worn for external support. Performing facet blocks and facet nerve denervation by radiofrequency can be very effective. Sacral or epidural steroid injections can also have a positive effect. There are generally only two indications for an operation. The first is ongoing disabling back pain that is not relieved by any conservative measure and a definite loss of quality of life. The second indication is impending permanent nerve damage. This is usually indicated by sciatica (radicular pain) or dysfunction of the nerves that supply the bladder and the bowel as well as sexual function (see the section Back Pain). The sacral nerves supply the outonomic (automatic) function of bowel, bladder and sexual function and can be compressed if the listhesis is severe. The first part of the operation is a decompressive laminectomy to free the nerves and this is supplemented by a pedicular screw spinal fusion. This is necessary because the spine is even further destabilised by doing the laminectomy. Please see the relevant sections on this website for a description and explanation of these operative procedures. The only complication of conservative therapy is the fact that it might be unsuccessful and therefore not prevent a spinal operation. It should, however, in the absence of impending permanent nerve damage, be the first line of treatment. See the section Your Back Operation for the list of potential complications of spinal surgery. For Grade I and II spondylolisthesis conservative therapy can be successful in up to 80% of cases. Surgical treatment can be successful in up to 90% of people. There has to be an ongoing commitment from the patient to strengthen their back and to apply good back habits for the rest of their lives (see the section Everyday Life).